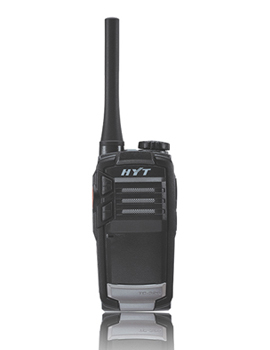 The HYT TC-320 is an Analog 4.68” tall Two way radio that weighs 4.76oz. With 16 channels, and superior, crisp audio for noisy environments this user friendly two way radio makes communications a simple process. The TC-320’s Wide frequency range allows FEDERAL, License Free and Commercial frequencies to be programmed. Covering the UHF 400-470Mhz with 2 watts, the TC-320 can be used in direct or repeater mode. Accessory port allows for the use of multiple ear pieces to be used for high noise environments and private conversations. The TC-320 ships with belt clip, wrist strap, antenna and a USB port for easy charging from the included wall charger as well as an optional desk top charger for convenience. A 6-Unit switching power supply is also available allowing multiple units to charge from one AC outlet. With a standard capacity battery and based on the 5-5-90 standard, the radio can provide up to 12 hours of communications. Its compact yet rugged double injected molding design allows it to survive a 5 Foot drop without sustaining damage. The TC-320’s size, features and ruggedness offers Hospitals, shopping centers, schools, churches and restaurants a fully featured two way radio that can provide years of service in those demanding environments. The TC-320 is covered by a standard 1 year Manufacturer’s warranty which can be increased to 2 years with the optional 1 year extension. The TC-320 is comparable to Motorola CLS1100 series, CLP1010 Series, Kenwood TK2400, TK3230.